Hi everyone! This is my most recent project in a veryyyy long time. My inspiration was the lovely Chie of Vivat Veritas. Chie is an amazing seamstress and I am constantly inspired by her work! I encourage you to look her up! 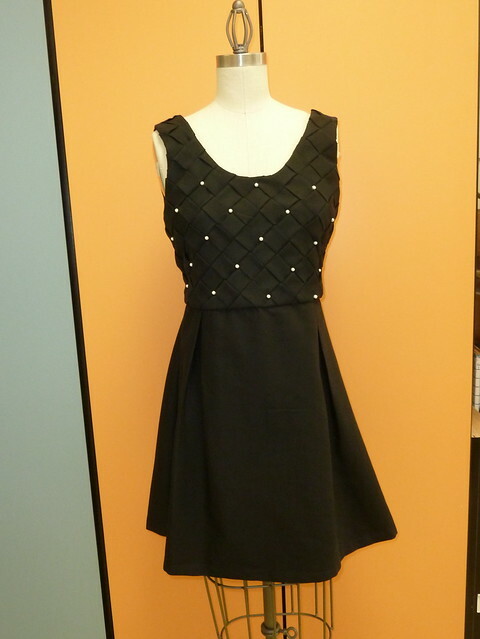 The dress is made from black cotton sateen and accented with glass faux pearls. I made it under a slight time crunch, so although I think I've done better work, I'm happy with how it came out! I used a pattern that I drafted myself. I love this bodice pattern because it's so simple but so satisfying. This time around, I made it with straps that tie into bows at the shoulders and inserted a strip of white piping between the bodice and skirt! The fabric is red sateen. It's really easy to sew with and doesn't require lining (though the bodice is fully lined). I used the U-neck view for the bodice and the skirt is a gathered rectangle. The bodice is lined and there are darts at the bust. I don't think babydoll silhouettes are super flattering on me personally, but I'm really proud of this dress and I can't wait to make more peter pan dresses in different colors! Hello there! Here is another dress I made using McCall's 5879 (this is the other one: https://www.craftster.org/forum/index.php?topic=386286.0), but instead of pleats under the bust, I made darts instead. I love the bodice pattern because no zippers are required! It's also really easy, so it's the perfect pattern for a simple summer dress. Hi! This is one of my latest sewing projects, created with the use of McCall's 5879. The dress is a pull-over style, so it doesn't have a zipper (I guess I should come clean and admit I have a small zipper-phobia!) and has two ties in the back. In honor of July 4th, I made a dress in appropriate colors! 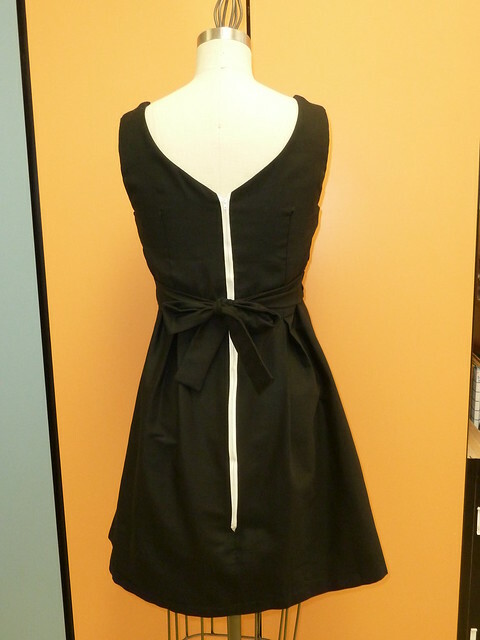 The dress has casings at the neckline for a tie to thread through and an elastic waist. It's very comfortable! This dress was inspired by the Very Easy Vogue sewing pattern, V8380. I made up a pattern right on the fabric. It didn't work out exactly as I had hoped, but I'm pleased with the results. I made this skirt about a year ago, but yesterday was the first time I got a decent photograph of it. I made it without a pattern because the shape is super straightforward: A rectangle for the waistband and a super long rectangle for the gathered skirt. It has a center-zip in the back and off-white lining because this fabric is very sheer. So it happens that a lot of my sewing projects are made in pink fabric. I'm not quite sure how that happens, as pink probably is not the most flattering color for my skin tone, but I go back to it again and again. I made this dress to wear on my boyfriend's birthday a few days ago. I made it on the day of in a few hours, so it has some technical "issues" but I'm happy to see a concept actually materialize as I envisioned it. A pattern was not necessary because the pieces are just different-sized rectangles. The bodice is lined and the top and waistline have elastic casings. I've been in a sewing funk lately, but I finally got around to making a new dress! The weather has been cloudy lately, so the lighting in the house hasn't been ideal, so I need to hold off on a mannequin picture for the time being. This dress is made from a yellow sheet set I got at Ross (cheap bedding = muslin material). I drafted the bodice pattern using McCall's M5800 for reference and borrowed the skirt piece from Christine Haynes Chic & Simple Sewing . It has bust darts and an elasticized waist. The bow is a strip of fabric sewn horizontally down the middle to the lowest part of the neckline. 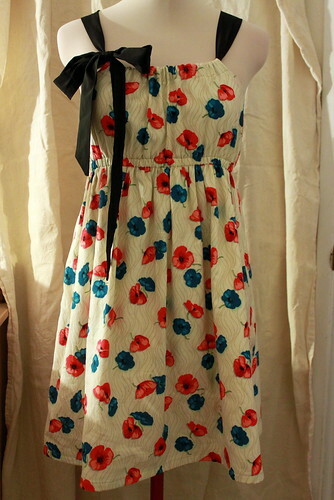 I tend to like bows that can actually tie, but I might use a ready-made bow for the next version of this dress. Comments and criticisms always appreciated!